Variable speed limits are displayed in a red ring overhead and are used when traffic volumes are high. These use monitoring sensors to activate lower speed limits and therefore ease congestion. A red ‘x’ symbol on a gantry sign over the motorway indicates that a lane is closed due to an incident, or where people are working on the road. 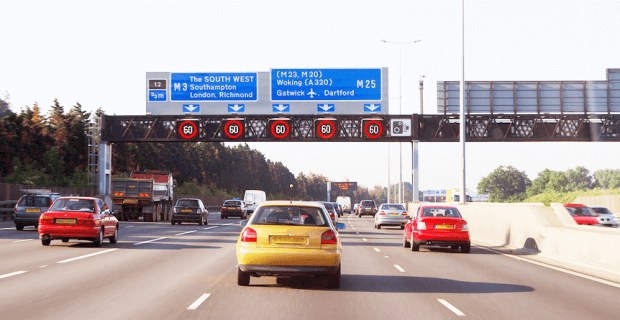 You can find out more about non-emergency motorway problems here. On some motorways, the hard shoulder is opened as an extra lane at busy times and the speed limit is reduced. Remember: Only use the hard shoulder when overhead signs show you that you can do so, or in an emergency. Never driven on a motorway before? Take a look at our first time guide. ‘Better watch your speed’ – you must stick to speed limits displayed in a red ring. When no speed limit is shown, the national speed limit of 70mph is in place. ‘On time journeys’ – speed limits vary at busy times to keep the traffic flowing and make journey times more reliable. ‘Be safe’ – millions use motorways every day so think about how the decisions you make affect others. ‘Don’t risk it’ – speed limits on smart motorways are enforced by police and if you break the speed limit you will be caught. ‘Respect our road workers’ – drive carefully and stay within the speed limit to help keep road workers safe.